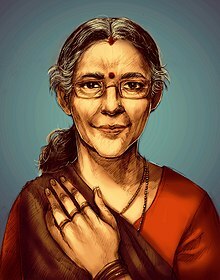 Jashodaben Narendrabhai Modi is the wife of Indian Prime Minister Narendra Modi. Their traditional marriage was arranged in Vadnagar by their families when they were children. The couple married in 1968 when Narendra Modi was 18 and Jashodaben was 16. Shortly thereafter Narendra Modi ceased living with Jashodaben, traveling for three years to practice Sannyasa, going into business with his uncle, and later pursuing public office. He did not officially acknowledge this marriage until 2014 during his campaign. Jashodaben continues to identify as the wife of Narendra Modi. She completed her education and had a career as a teacher. Jashodaben Narendrabhai Modi (born 1952) is the wife of Indian Prime Minister Narendra Modi. Their traditional marriage was arranged in Vadnagar by their families when they were children. The couple married in 1968 when Narendra Modi was 18 and Jashodaben was 16. Shortly thereafter Narendra Modi ceased living with Jashodaben, traveling for three years to practice Sannyasa, going into business with his uncle, and later pursuing public office. He did not officially acknowledge this marriage until 2014 during his campaign. Jashodaben continues to identify as the wife of Narendra Modi. She completed her education and had a career as a teacher. Retired from teaching, Jashodaben lives a simple life of prayer. As the spouse of the prime minister, she is protected by a security detail, but has been unable to learn what their orders are or what rights she has in this position, despite filing suits with the government. Indian media and commentators have discussed the controversial circumstances of this marriage within the context of relations between men and women in society.